The telecast kicks off with a bang! Bobby’s kitchen buzzes with celebrity chefs whipping up their most scrumptious dishes. That’s until the lights mysteriously flicker off and out of the shadows, Red Ghost appears frightening all the guests, who run out in a panic. Is the legend of Red Ghost real after all? 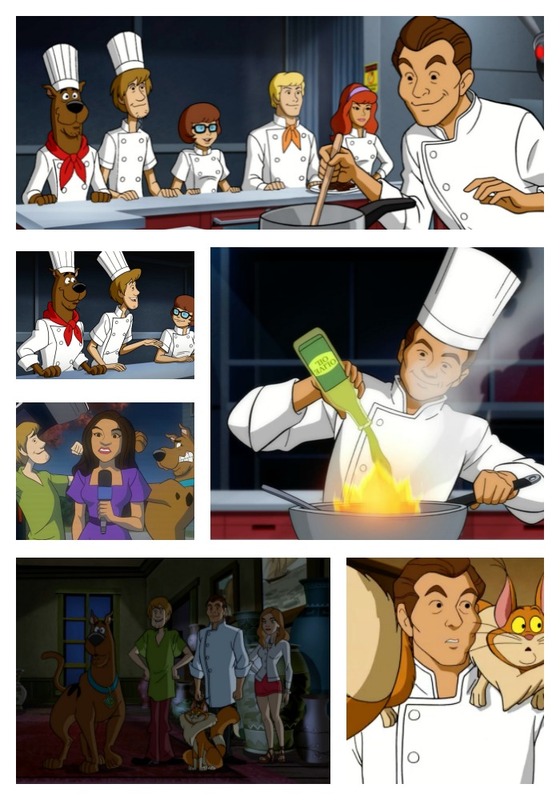 Does this mean the end of Rocky Harbor Culinary Resort or will Scooby-Doo and his pals help save the day? 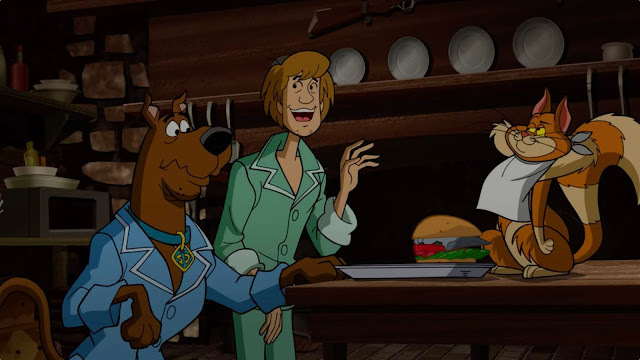 It’s a delicious mystery Scooby-Doo!fans won’t want to miss! Last week, the kids and I took a trip to see my Granddad and they couldn't wait to use that opportunity to check out this new Scooby-Doo movie. Having the famous voices of Bobby Flay and Giada De Laurentiis made the mystery seem all the more real! The kids were on the edge of their car seats as they watched the movie unfold. Plenty of laughter and even a little bit of history was woven into the storyline. From start to finish, my kids always enjoy trying to solve the mystery for themselves and this movie was no exception, though I think this one had them a little more stumped than they usually did. At the end there were several cries of, "Be quiet! They're about to reveal who it was!" This was a super fun movie that we all enjoyed. It will no doubt become one of the regular classics that we continue to enjoy, even though we know how it ends. Scooby-Doo! 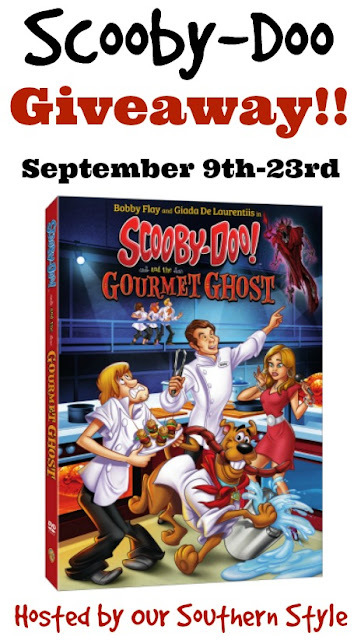 And the Gourmet Ghostwill be available to own on Digital beginning August 28, 2018. Digital allows consumers to instantly stream and download all episodes to watch anywhere and anytime on their favorite devices. Digital is available from various retailers including Amazon Prime Video, iTunes, PlayStation, Vudu, Xbox and others. You can also buy a DVD copy Tuesday, September 11th, wherever movies are sold! Both versions include the movie and three bonus episodes! Click HERE to check out other movies from Warner Bros. Home Entertainment! One lucky reader will win a DVD copy of Scooby-Doo and the Gourmet Ghost! To enter, just use the Giveaway Tools form below. Giveaway open to the lower 48 United States, ages 18 and up. Ends 9/23/18 at 11:59pm EST. Disclosure: I received the item pictured above in exchange for facilitating this post. Our Southern Style is not responsible for prize fulfillment. One winner will be randomly selected using the Giveaway Tools random selector and notified via email. Once notified, the winner will have 48 hours to respond or a new winner will be chosen. This giveaway is in no way associated with Facebook, Twitter, Instagram, Pinterest or Google. Void where prohibited.